Whether you’re in Perth for a conference, visiting a university student or staff member, or are viewing the campus as a prospective student, Trinity on Hampden provides the ideal choice of accommodation near UWA. Our guest accommodation is located directly opposite The University of Western Australia, with complimentary onsite parking and public transport at your doorstep. If you’re looking for a shorter alternative to long term residential UWA accommodation, Trinity on Hampden has all the features to make your stay in Perth comfortable and stress-free. Conveniently located within the heart of the western suburbs, Trinity on Hampden is close to Perth’s CBD, Kings Park, Fremantle and of course, our local Nedlands’ café strip, which is only a short walk away. Our air-conditioned en-suite rooms are perfect for business or leisure travel with complimentary breakfast and parking included. You can relax and enjoy your stay in our beautifully maintained rooms at Trinity on Hampden. Walk: Located on the other side of Stirling Highway, Trinity on Hampden is a short 250 metre walk to UWA, that will take approximately 2 minutes. Drive and Park: If you wish to drive to the campus, it will only take about 2 minutes however, you will be charged accordingly on weekdays. Parking is free on weekends and during Universtiy breaks. Public Transport: Catch the 950 bus (located directly outside Trinity on Hampden) one stop to arrive just a one minute stroll from famous UWA landmark Winthrop Hall. 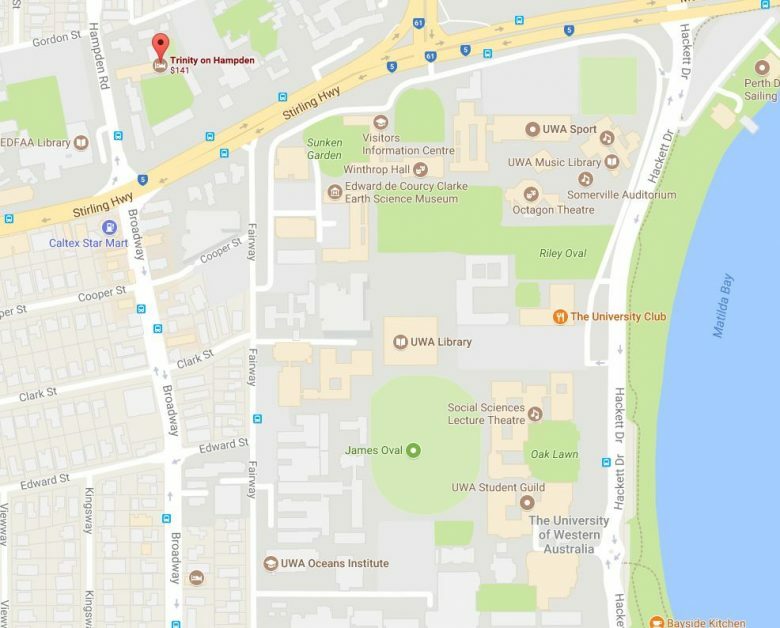 Alternatively, the 97 bus (also directly outside Trinity on Hampden) will take you to the UWA Business School at the far end of campus; just a 5 minute ride away. Trinity on Hampden provides short-term rooms, perfect for those visiting the university. For long-term residential living, visit the Trinity website to enquire about UWA accommodation. To book your stay at Trinity on Hampden, or for more information, contact us today on (08) 9423 9423!